School of Population and Public Health faculty and students won several awards at the 50th anniversary of Postgraduate Public Health Training in Western Canada. Professor Mieke Koehoorn and Associate Professor Eugenia Oviedo-Joekes won 2016 Cortlandt J.G. Mackenzie Prizes for Excellence in Teaching. The prize is awarded for the highest scores on students’ evaluations of course teaching in the School of Population and Public Health for the year. The prize is named after Dr. Cortlandt John Gordon (C.J.G.) Mackenzie, who was the Acting Chairman of the Department of Health Care and Epidemiology (from which the School was formed), from 1969 to 1973 and Head of the Department from 1973 to 1980. Dr. Mackenzie’s family attended the 50th anniversary, with the prize presented to Dr. Koehoorn by Aleck Mackenzie. 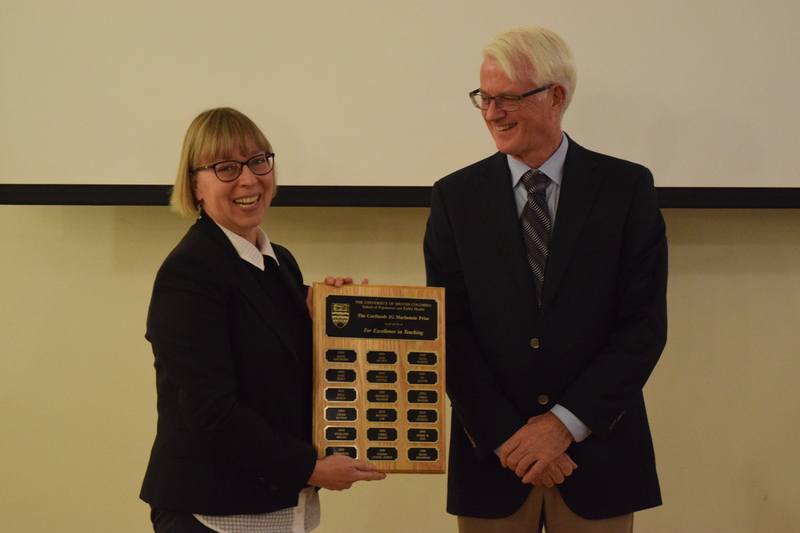 Dr. Koehoorn said she was honoured to be recognized in this way, and humbled to receive a teaching reward named after Dr. McKenzie, who was instrumental in advancing epidemiology and public health in British Columbia. She said she strove to create a supportive learning environment in which students felt comfortable pushing the boundaries of their knowledge and skills but where they also got to experience the satisfaction of discovering or conquering something new. Dr. Oviedo-Joekes said she thought one important component of teaching was to truly listen to students and build with them, and from their experiences, the content of the class, making it meaningful to them, helping them connect with the subject matter, and hoping that they would leave the class wanting to do more. She said she taught a topic that brought up feelings of injustice, and where evidence did not seem to be enough to change policy. Dr. Oviedo-Joekes said she was truly lucky to have the opportunity to be part of the students’ journeys through such important topics, and to see them grow. Clinical Assistant Professor Mark Lysyshyn won the UBC Public Health and Preventative Medicine (PHPM) Residents’ Appreciation Award, which recognizes outstanding contributions and achievements to teaching within the PHPM residency program. He said public health and preventive medicine is a great specialty because public health issues are complex, constantly changing and touch so many aspects of society. 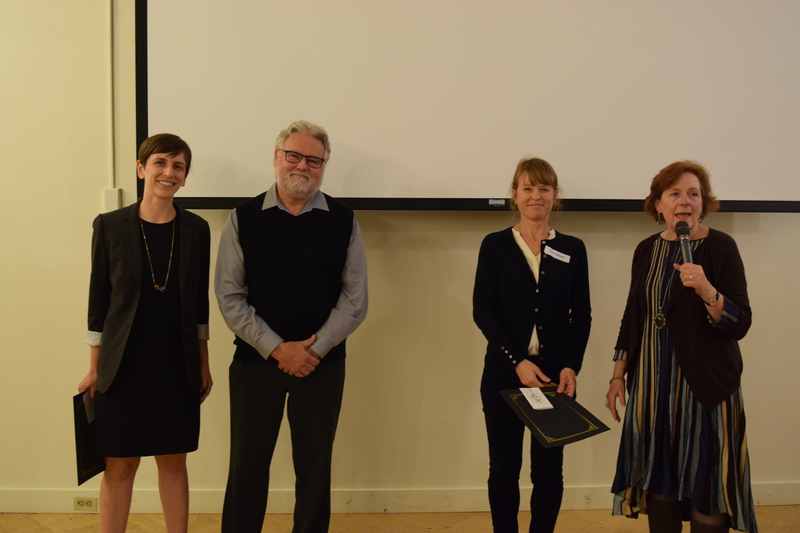 Residents Alexis Crabtree and Geoff McKee won the Best Presentations at the Resident Research Day for their presentations, ‘Prescribing histories among people who overdose: Preliminary findings from the BC Opioid Overdose Cohort’ and ‘Outbreak of invasive Streptococcus pneumoniae infection among a vulnerable, inner city population in Victoria, BC, 2016-2017′ respectively. Dr. Crabtree said she tried to focus on three things when making a presentation: understanding what the audience already knew and what more they needed to know, finding the human stories in the data, and identifying places where she could insert her skills and personality. Presenting the BC Opioid Overdose Cohort results felt like a big responsibility, she said, because of the scale of the suffering and the importance of getting the analysis right. Dr. McKee said it was exciting to see the high caliber of research presented by fellow residents, as well as their diverse areas of interest, ranging from microbial genomics to the application of ethnocultural perspectives to public health issues. 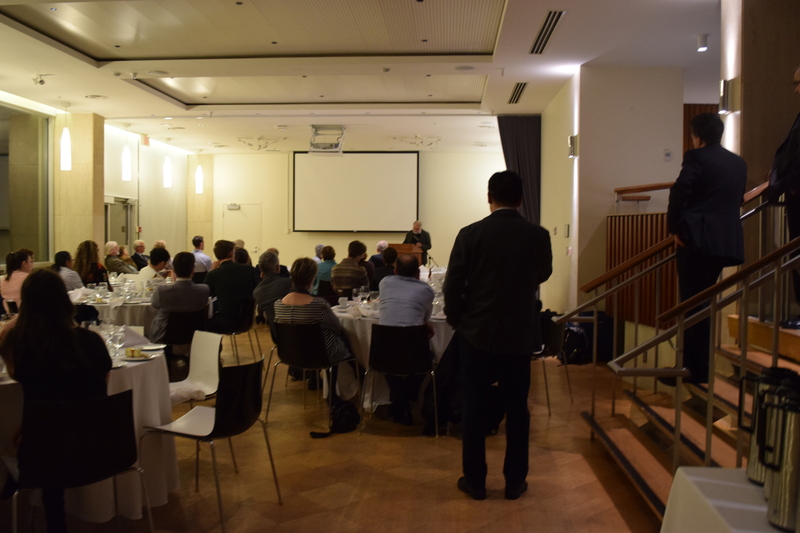 He said he came away from the event with new perspectives and tools to use in his own public health work.